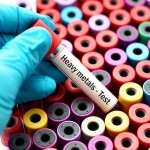 What is a Heavy Metals Test? Heavy metals, which are not always metals at all but may be dense metal-like elements, are found naturally in the environment. They are also used widely in manufacturing and can contaminate soil, air, food, and water. As industrial pollutants, they may be highly persistent and concentrate in the environment. Some of them, such as selenium, are required in trace amounts by the body for normal function but can be toxic at higher levels. Significant concentrations of any of the heavy metals can be irritating or damaging to the body. Who should get a Heavy Metals Blood Test? Arsenic may be found in high levels in soil. Chronic exposure to arsenic leads to distinct skin diseases, such as arsenical keratinosis, and increased risk of skin cancers. Arsenic poisoning can also lead to constriction of blood flow, decreased nerve function, and lung, liver, kidney, bladder, and other cancers. Mercury is found in many places but is increasingly found in high levels in ocean fish like tuna. High mercury exposure results in permanent nervous system and kidney damage. Cadmium is used in battery-making. Long-term exposure can lead to kidney, bone and lung disease. Bromine may be found in the environment, and it is a starting material for flame retardant coatings (it is however not found as Bromine in these coatings). Chronic exposure can lead to lung disorders and systemic poisoning. Selenium, which is needed in trace amounts for normal body function, can be found in many home products including dietary supplements. Chronic exposure to selenium can cause selenosis, which includes nervous system and skin issues. Iodine is a naturally occurring element found in sea water and is used in disinfecting agents, soaps, and bandages. Iodine is needed for normal body function, in particular thyroid gland function. High levels of iodine may cause thyroid dysfunction.